The Barclays LIBOR scandal is expected to open doors wide open for private litigation. We know what that means for Barclays - the stock is down 11% for the day. But what does that mean for the LIBOR index? It is possible that some banks will simply stop contributing to BBA in order to avoid running into similar problems in the future. Controlling flow of information across "the wall" (traders to contributors) in large institutions is difficult and expensive, and given that banks make no money by contributing, it may not be worth the risk. As discussed before, this index is completely artificial in Europe. LIBOR/EURIBOR represents unsecured interbank lending which is not taking place among European banks, as they have almost entirely shifted to secured financing (repo) either with each other or increasingly with the ECB. And even in the US where interbank unsecured lending still takes place, the market is becoming much less relevant. The chart below shows the total size of interbank loans for all US commercial banks going back to the 80s. The number is just over $100bn, which may seem like a large amount, but it's a fraction of what it was at the peak. What's even more striking is what this number represents as a fraction of the overall bank assets in the US (see chart below). 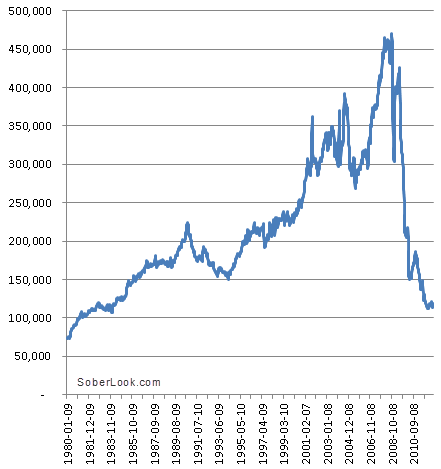 Interbank loans are now just over 1% of total bank assets - the lowest in history. And there is some evidence that most of it is under one week in tenor. 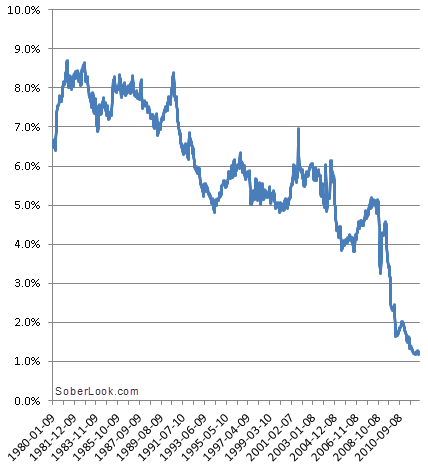 That means that even in USD, the 3-month LIBOR generally does not represent actual transactions. There are a number of reasons for this decline. Banks don't want the credit risk of lending to other banks when they can deposit money at the Fed who now pays them interest. Just as importantly banks don't want to rely on interbank borrowings for funding because that funding could disappear very quickly in a crisis. Instead banks are increasing customer deposits (see this post for more info) because those tend to be far more "sticky". And regulators, rating agencies, and stock analysts prefer it that way. We clearly need some alternatives to LIBOR that may represent actual transactions, ideally in an active market.